Remember when you decided to create a profile for your business Facebook page rather than setting up an actual page under your personal profile? Don't make the same mistake on Google+. As tempting as it is to setup a user profile for your business, it will bite you in the rear in a few months. Recent numbers show over 20 million unique visitors to Google+, and it is already the fastest growing social network the internet has seen. For now, you need to get in there personally and get familiar. Google setup a form for you to request being included in their business profile test. According to the video above, thousands of brands have requested to be included. 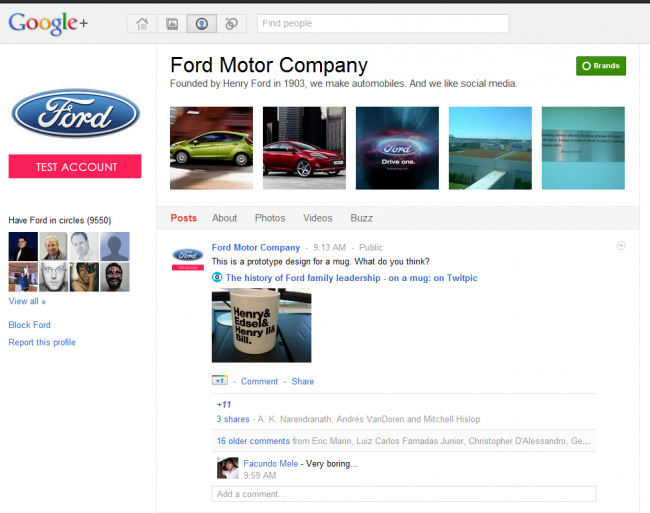 As seen above, Ford Motor Company is among one of the very first brands to get access to a business profile. I highly recommend adding them to one of your Circles in Google+ to keep an eye on what they do. I created a Circle called Brands, just for monitoring how businesses use Google+. Final Warning - Don't Create a Profile For Your Business Yet! Google has already gone through and shutdown many profiles that ignored the request to NOT setup a profile for a business. Some of these brands were quite large, like MSNBC and Mashable. They will not be developing a migration tool to move personal profiles to business profiles, so the migration will be manual if you ignore this warning.